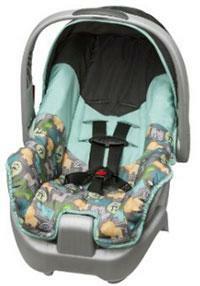 Looking for a cheap infant car seat without compromising too much safety or comfort? You've come to the right place! We put 11 infant car seats to the test, all of them coming in under $100 at Amazon. Most are $89-99, but some are as low as $50-60, and to be honest some of them were surprisingly great! In our hands-on reviews, we considered Safety, Ease of Use, Versatility, Comfort, Reliability, and of course, Cost. For more details on how we used these factors to find the best budget infant car seats of 2019, scroll down to the bottom of this page. Otherwise, let's get into the reviews! Here are the Best Cheap Infant Car Seats of 2019! 1. Graco SnugRide Click Connect. The Graco SnugRide line includes 30 and 35 models, with the 30 coming in typically below $100. The primary difference between the 30 and 35 models is the weight capacity (30 and 35 pounds, respectively). But both of them have some awesome features. 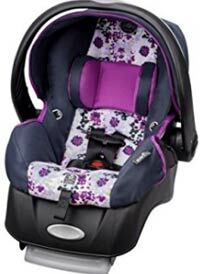 This Graco car seat supports babies from 4 pounds (using the provided infant insert) up to 30 pounds, or up to 30" tall (whichever comes first). The "Click Connect" feature makes connecting and disconnecting the car seat from its base really easy, using a one-handed lever on the upper back of the seat. And the "click" is great, because it means you can hear the seat attach securely to the base each and every time, giving you peace of mind. Speaking of clicking the seat in, this SnugRide also includes the LATCH system, which attaches to most modern cars. Without the LATCH, you can use the car's existing seatbelt to secure the base. We were impressed with a few things in particular. First, we liked how lightweight this car seat was, coming in at only 7 pounds when removed from the base. Of course, add a 20-pound baby and you'll be working those biceps in no time! Second, we liked the soft, breathable fabrics, and the reasonably sized sun shield. Finally, we loved the positioning of the shoulder strap adjustment belt, which is positioned just under the lower buckle. This is nice because it means you can still loosen or tighten the shoulder belts while the seat is attached rear-facing (when the front is jammed up against the car's seat). This seat pops easily into and out of any of the Graco Click Connect strollers. 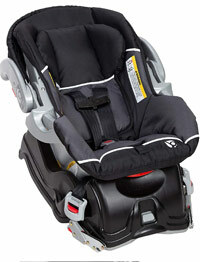 Overall, it's no surprise that the SnugRide is the most popular, best selling line of infant car seats. Highly recommended! 2. Evenflo Embrace LX Infant Car Seat. This Evenflo seat is an awesome option, with some great features. First and foremost, this seat is rated for babies from 4 pounds (using the infant head rest, which is included) all the way up to 35 pounds! That's an awesome weight range for a car seat under 100 bucks! Second, it's really super lightweight when taken off the base. We weighed it ourselves and it came in just under 6 pounds, which is quite impressive. The only downside to that is the lightweight materials can feel a little flimsy, which some of our testing moms thought made it feel less sturdy than the Graco. Getting it into and out of the base was pretty smooth and easy, without any issues. Like the Graco, the shoulder straps can be loosened and tightened using an up-front strap, though it's not as conveniently positioned as with the Graco (it's a bit too far forward). There are three shoulder strap positions to adjust for a growing baby, but they require re-threading from the back of the seat. Let's talk about some of the cons relative to the Graco. First, the canopy doesn't do quite as good of a job covering your baby from the elements. Second, the fabric is easy to clean and machine washable, but it's not very breathable, which we didn't appreciate. Finally, it doesn't come in as many (or as cute) colors or patterns. All that being said, this is a great car seat option, especially if you're looking for something that's very lightweight and inexpensive, and does a pretty darn good job for the money! 3. 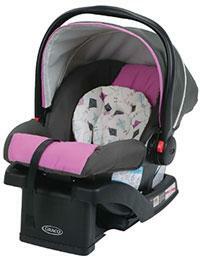 Baby Trend Flex Loc Infant Car Seat. This Baby Trend seat has some great things going for it. For starters, we love the carry handle that allows you to carry the seat in a bunch of different positions. Rather than forcing you to carry it with your arm parallel to your body, you can also hold it at a bunch of other angles, which is perfect for when your baby gets a little heavier and your arm gets sore from lugging it around! Second, this seat has an adjustable 5-point harness that requires no re-threading from the back! That's rare in a $150-200 car seat, nevermind a sub-$100 seat! Third, the fabric is soft, easy to clean, and surprisingly breathable. We found that it clicks easily into and out of the base without any issues. Finally, it uses an up-front shoulder strap adjuster to loosen or tighten, and it is conveniently positioned for adjustment even when connected to the base. But there were some little things that annoyed us in our tests. We found the shoulder straps a little flimsy, which caused them to twist around and frustrate us when we went to buckle in the baby. We also thought the handlebar was really difficult to adjust; we had to press the buttons really hard for it to come loose, and then we found ourselves pushing pretty hard on it to adjust it back or forward (that was one of the most frustrating aspects of this seat!). The weight range isn't great either, supporting from 5 to 30 pounds. Speaking of weight, it felt a bit heavier than most other options on this list. Finally, we also found the crotch buckle really difficult to figure out, and for the first several times we really wondered how this car seat was so popular! After several attempts we finally figured out how to get it done with one hand, which was great, but it took a lot of time to master! We found some great color options online here. 4. Evenflo Nurture Infant Car Seat. This Evenflo option is the cheapest infant car seat on our list! Coming in usually under $60 or so, this car seat has some great features, but also some big limitations. Let's start with the positives. The Nurture has a great safety record, and uses a 5-point harness with 3 shoulder height adjustments and 2 crotch position adjustments (with re-threading). The cushion was soft and breathable, and machine washable (and we thought it was pretty easy to get on and off). Finally, we were surprised that it was both lightweight (about 6 pounds), and felt pretty sturdy and decently constructed. But the advantages sort of stop there. The canopy is small, there is no infant insert, the shoulder strap adjustment is difficult, there is no LATCH system, and attaching to the base was nowhere as easy as with the others on this list. Finally, its very limited in weight range, supporting babies from 5 to 22 pounds. It was a tough call figuring out which car seat would be in this position, or the last position. But given the great low price point of this car seat, it's a good option for people on a very tight budget looking for a safe, reasonable car seat without frills. 5. 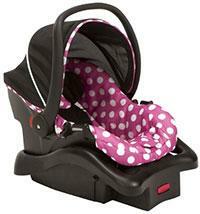 Disney Light N Comfy Infant Car Seat. This adorable car seat definitely compromises flexibility for the cute factor! The Mickey ears and the pink polka dot versions got our test moms excited about this car seat, but after reviewing some of the options their excitement tapered off. Let's be clear that there are some great features here, especially for a cheap infant car seat. First, its 5-point harness is adjustable across 4 heights (with re-threading), and the crotch buckle is adjustable across 3 settings. Second, it was reasonably lightweight, making carrying around time quite a bit easier. Third, we thought the positioning of the shoulder strap adjustment was quite good, being high up enough to make adjustment possible even when the seat was attached to the base. Finally, let's comment again on how darn cute this thing is! But the positives end there. The weight range is extremely low, ranging from a great minimum of 4 pounds, but topping out at a measly 22 pounds or 29" tall. That's a really low upper limit and is quite disappointing! This seat is only to be used rear-facing. We also assumed the cute bowtie insert was for infant head support, but found that it did a pretty poor job overall of supporting a baby's head from flopping side to side. Finally, the build quality wasn't great; the carrying handle flexed a lot with a 20 pound baby in it, and the sun visor was flimsy. Overall, it's an OK last option for our list. If you think the Disney pattern is awesome, then this is the seat for your baby! Note that this is largely the same seat as the Cosco Light N Comfy seat. Here are more details on what we considered when finding the best cheap car seats of 2019! Safety. We want to be clear that all of the car seats on this list, and all of the car seats sold legally in the U.S. conform to the very same government (NHTSA) safety standards. Some do have some extra safety features, however. For instance, the anti-rebound bars that are common in Europe are slowly making their way into the U.S. market, but typically not in a car seat coming in under $100. The most important thing you need to do to make sure your baby is safe, however, is to ensure the car seat is new (not used), has never been involved in a car accident, and is installed correctly for your vehicle. This includes both securing it to the seat using the manufacturer's recommended configuration and methods (seat belt and/or LATCH system), and also putting it at the appropriate incline/tilt. If you ever have any doubts, go to your local police or fire department and they will take the time to make sure you've done everything perfectly (they are trained in it). So in our opinion, you can be confident that once all of this is done correctly, the car seats on this list are basically equally safe for your little one. To learn more about car seat safety and how different safety features are used and what to look for, check out our buying guide for car seats here. Ease of Use. This is something that's very important for an infant car seat, but you will need to compromise a bit for the sub-$100 price range. Some of the features to look for are: a handlebar that can be adjusted with one hand, a handlebar grip that is at a 45-degree or 90-degree angle to your body to make carrying easier, and shoulder straps that can be adjusted to a growing baby without any rethreading from the rear of the seat. Outside of that, other things are important to keep the seat from being super annoying: you want a chest buckle that doesn't pinch you or take too long to unbuckle, shoulder straps that aren't flimsy and twist around, and a base attachment/detachment mechanism that isn't a super pain in the rear! All of the car seats listed below do a decent job with these tasks, even with their low price point. Baby Size. Infant car seats are typically rated from about 4 or 5 pounds (newborn) up to 30 or 35 pounds. Most seats in the sub-$100 range will top out at 30 pounds, and not go down all the way to the 4 pound minimum. Be sure to read the specifications. If you haven't had your baby yet, but are already well into the third trimester, you're probably safe getting a seat with a 5 pound minimum. In terms of the weight limit of 30 or 35 pounds, we find that usually the 30 pound limit is sufficient for 80-90% of babies. By the time your baby is tipping over the 30 pound mark, they're usually ready to transition to one of the best convertible car seats. Comfort. Your baby will be thanking you for finding a comfortable car seat. You want the seat to be plush and comfortable, with a soft fabric that is breathable. The breathable part is one of the most important issues: if it's not breathable, your baby will wake up soaking wet from a nap and probably screaming from all the uncomfortable sweat that has built up his/her body. That's not fun for anyone!